This is one in a series of encyclopedia articles describing people, products and companies in the genealogy industry. When you hear a noted genealogist's name, do you find yourself thinking, "I know I know that name," but you can't quite get the ol' noggin to access the data? I'm right there with you! For that reason, these articles are. They had me the moment they listed my blog on their Genealogy Insider blog. But the staff at Family Tree Magazine continue to do little things that endear them to me. and Diane Haddad, managing editor. First let me introduce them using a photograph from their holiday greeting in December-2007. 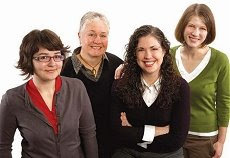 Pictured (left to right) are Grace Dobush, assistant editor; Kathy Dezarn, art director; Allison Stacy, editor; and Diane Haddad, managing editor. In January-2008 Grace wrote about her first trip to a Family History Center where she discovered she gets seasick using a microfilm reader. My first thought was... Well, actually my first thought was, "this is a young group." But my very next thoughts took me back to days at the Salt Lake Family History Library with my father and mother. We arrived shortly after the library opened in the morning. And we stayed until late afternoon when we were so tired we had started getting seasick as the microfilm images zoomed past. Now my father is gone and those are shared memories never to be forgotten. Grace, Kathy, Allison and Diane. 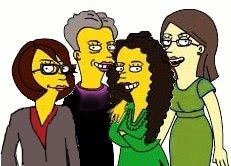 In August-2007 the staff came across the Simpsonize Me website and posted Simpsonized portraits of the whole crew. I've rearranged their positions to correspond with their holiday greeting. What do you think? Do their Simpsonized selves match their real selves? For more on Tamagotchi trees and how kids can research their own families, watch the video (remember, I woke up before the crack of dawn) on San Diego's NBC affiliate Web site. I was hoping for Tamagotchized portraits, but no luck. Wow, thanks for writing about us! But now we're really curious—what do you look like Simpsonized?